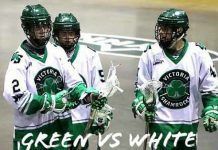 July 3, 2013, Victoria, BC (ISN) – The Nanaimo Timbermen came into Bear Mountain Arena Tuesday evening to face the Jr. Shamrocks, looking for their second ‘on-floor’ win. In the early going, it looked as if they might get it as they opened up a 4-1 lead by the 6-minute mark of the first period. They were unable to hold on as the teams combined for 16 goals and finished the period tied 8-8, before falling 27-17. Starting goaltenders were Cody Hagedorn and Nate Clark for the home and visitors respectively. Victoria got on the board right off the opening faceoff, Chris Wardle scoring at the 7-second mark. Immediately Nanaimo replied, Mac Johnston scoring at 42 seconds. The T’Men rattled off 3 more – a second from Johnston at 1:26 followed by Travis Mickelson at 2:33 and Brett Hawrys at 5:59. Not a great start for the Rocks, allowing 4 goals on 6 shots. But if they’ve proven anything this season it’s that they can score goals – so they did. Devon Casey scored at 6:16 from outside the dotted line. The teams traded shorthanded goals, Dane Schoor connecting at 8:01 for Victoria and Hawrys picking up his second at 11:19. A Shamrocks power play goal off the stick of Brody Eastwood at 12:15 was the start of a 3-goal run for the home team as Jake Cullen followed up at 12:48 with a bullet from well out and Max Fredrickson added another at 13:29, getting in close, to give the Rocks a 6-5 lead. Nanaimo came back with 3 in less than a minute, 2 of those shorthanded as the resident goon took 55 minutes in penalties all in one attack at 15:37. The Shamrocks came back with a pair of power play markers to end the first period in an 8-8 tie. Shots on goal were pretty even at 19-18 for Victoria. Jordan Kuziek was out of the game for Nanaimo having amassed 59 minutes (the period is only 20 minutes long). The second period saw Victoria outscore the Timbermen 10-4 and outshoot them 21-10. Four of the Shamrocks’ goals came with the extra man, while Nanaimo scored once on the power play. The middle frame was quite tame penalty-wise, although there was a 5-minute slashing penalty against Nanaimo’s Alex McDougall. They aren’t called Timbermen for nothing apparently. The third period got even uglier. The teams combined for 14 goals and two more fights resulted in two players from each team being assessed major penalties and game misconducts. Nanaimo received 104 penalty minutes in the game to Victoria’s 49. Why Nanaimo is even allowed to compete in this league is frankly beyond me – and many other fans from what I heard during this game. In any event, the Shamrocks need the two points but giving up 17 goals isn’t necessarily a sign fans want to see as the team moves towards playoffs. The result has the Shamrocks and Langley Thunder tied for third place with 22 points, 2 ahead of Delta with all teams having 2 games remaining. Langley has the tie-breaker in the event they remain tied at the end of the season. With all that scoring, players have certainly boosted their personal stats and these players scored lots: Jesse King (2 goals and 11 assists), Chris Wardle (5 goals and 5 assists), Dane Schoor (7 goals and 2 assists), Brody Eastwood (4 goals, 3 assists), Devon Casey (a goal and 4 assists). Jake Cullen and Mason Pynn each had a hat trick and Pynn chipped in 2 helpers. Singles came from Jordan Cunningham and Max Fredrickson. Dominik Pesek picked up 4 assists while goaltender Cody Hagedorn and newcomer Justin Appels each had 3 helpers while Appels won 20 of 30 faceoffs, a huge stat for the team. Nanaimo wasn’t without some high point totals. Corey Shires and Brett Hawryseach had 5 goals and 3 assists, Mac Johnston and Mitch Parker each had a pair of goals and 2 and 4 helpers respectively. The Shamrocks have just a pair of games remaining and they will wrap up the regular season this weekend with a home-and-away series against the Port Coquitlam Saints. PoCo comes into Bear Mountain for a 5:00 start Saturday – it will be Fan Appreciation Day so come out and be appreciated by the players for your support throughout the season. 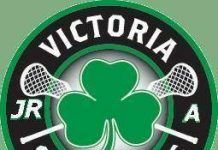 If you really like lacrosse (like I do), come out at 1:30 and watch the Intermediate Shamrocks play their final regular season home game as they host the Langley Thunder.